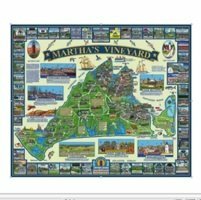 This jigsaw puzzle of Martha's Vineyard Island, along with the many businesses and attractions, including Island Alpaca Farm, will provide you with a wonderful way to send a thoughtful message from your time on Martha's Vineyard. Beautifully rendered graphics by Island Artisan Dana Gaines, this puzzle has 24 pieces, and has a finished size of 6" x 7.75". Makes a great way to send your message! Simply write your personal message on the back of the Martha's Vineyard Puzzle Postcard. Take the puzzle apart and put the puzzle pieces in the envelope provided, and mail with the proper postage. The recipient must put together the Martha's Vineyard Puzzle Postcard together to read your message! This artwork is also available as a 1,000 Piece Puzzle (24" x 30") Click on image below to visit that page! Puzzle recommended for AGES 5+. Special Notice: Due to the nature of this product, adult supervision required for young children. If this toy or any toy ordered is intended for a young child, please assume the following warning applies: Warning: Choking Hazard due to small parts. Not intended for children under 3 years of age. Remove all hang tags and their fasteners before giving this product to a child.